CurlyPops: Santa Sacks now available! 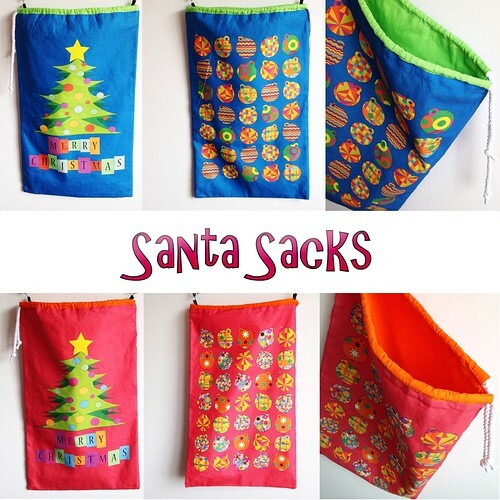 Santa Sacks now available!, a photo by CurlyPops on Flickr. I had big plans for my stall at Maribyrnong Makers Market the weekend, but there are just not enough hours in the day to achieve everything I want to do, so unfortunately I've had to pull out. Of course that means that I have lots of stock to sell online instead. I have lots of lovely and completely unique Santa Sacks available via my Facebook Page. Theyre an original CurlyPops design printed onto a lovely cotton/linen blend. They're fully lined with cotton drill and have a drawstring closure. If youd like one just pop on over to FB and comment!